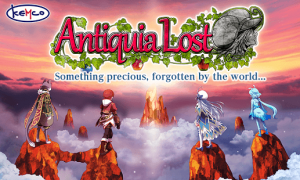 RPG Antiquia Lost : Play to the end of the game for free! An authentic RPG in which you journey with a girl made of slime! Bine is a young man who lives in a small rural village. One day, he is asked by Lunaria, a girl who lives near the village, to go with her to the royal capital. With more and more disappearances occurring, the rulers’ reactions are mixed. By eating gems, her statuses are strengthened, and she can learn new skills. In battle, she has a powerful death-blow skill: she can mimic monsters! Special actions, such as smashing rocks or squeezing through narrow gaps, are possible, depending on the character at the head of the party. Try to find all the hidden items! By planting beans in plant pots, you can harvest many different items. Every now and again, you might grow something incredible! The game features many well-loved achievements, including weapon development and arenas where you can fight against strong enemies. Please use the ‘Contact’ button on the title screen to contact us in case of bugs or other problems. If you try to contact us in a review, we will not be able to respond so quickly, and support will be more difficult. Also, please be aware that if you use the ‘Don’t keep activities’ on Android, which is an option intended for developers, or if you use an app that places restrictions on tasks, the game may not run correctly. A premium edition of the game (a paid app), which includes 1000 Alchemy Stones from the beginning, is also available! Search for ‘Antiquia’! This app has generally been tested to work on any mobile device released in Japan. We cannot guarantee full support on other devices. I really loved the game. Great battle system, though a bit broken with the Stun-up gems and SPD down combination. However, I suggest improving the trust systems. Some of the conversation selections didn’t always make sense, leaving you to guess. And also, the marriage part was really frustrating. It seems to take a lot of time and effort just to achieve a marriage ending. Heck, the true ending was easier. Absolutely Amazing This game is one of the best JRPG I played. For a mobile game its mind blowing. Music and story are amazing, anyone who hasnt should give This game a try. You can Get through the game easily without paying a dime although I was willing to spend a few bucks Since I love this game. OMG, got Jade ending. I love you Jade. Wish MC and Jade get married.